See King Crimson live on the 2019 Celebration tour! King Crimson play London's Albert Hall on the 18, 19 and 20th of June 2019. It’s mid-August, 1969. 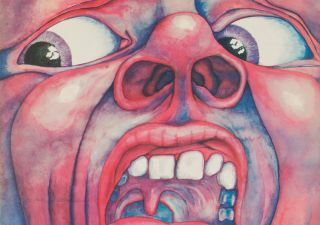 The apocalyptic blast of 21st Century Schizoid Man is abruptly cut off in mid-flow as engineer Robin Thompson mutes the speakers in the London studio where it is being recorded. Gathered in the cavernous performance area of Wessex Studios, where their band King Crimson are recording, Robert Fripp, Michael Giles, Ian McDonald, Peter Sinfield and Greg Lake stop work to welcome the arrival of artist Barry Godber, who is carrying a large rectangular package wrapped in brown paper. A few weeks previously, Sinfield had commissioned his friend Godber to come up with something for the cover for what would be King Crimson’s debut album. Godber tore off the brown paper and laid the painting on the floor as the band gathered around to see his handiwork. Magic and King Crimson never seemed to be far apart during 1969. Even before they had played a proper gig there was an expectant buzz doing the rounds about the monstrous sounds emanating from the band’s rehearsal room in the cellar of a café on Fulham Palace Road in west London. Exactly one month after their first proper rehearsal, on January 13, Decca Records A&R man Hugh Mendl, having been persuaded by Crimson’s managers David Enthoven and John Gaydon to sample the band, arrived at the rehearsal room with Moody Blues producer Tony Clarke, with a view to having Crimson sign up to the Moodys’ own Threshold label. While many bands were cranking up the volume, as the burgeoning ‘underground’ scene demanded, what distinguished King Crimson from most of their contemporaries was their lethal combination of claw-hammer brutality and surgical precision. They were summoning up musical forces not only possessing immense subtlety but also with the power to drive punters into the ground like tent pegs. It was this impressive combination that turned heads and got the word-of-mouth bush telegraph buzzing. Almost every band starting out has a wish-list of hopes and dreams – getting good; getting in print; getting on John Peel’s radio show, getting big, getting signed; getting an album in the Top 10. In just 1969 King Crimson got the lot. Even now, looking at it from 40 years’ distance, the speed of their progress is breathtaking. In April they played their first London gig, at The Speakeasy, to great acclaim. In May they recorded a session for John Peel. That same month, Jimi Hendrix saw them play at another hip London club, Revolution. Shaking guitarist Fripp’s hand, Hendrix declared excitedly to anyone who would listen that Crimson were the best group in the world. With that endorsement still ringing in their ears, in June the band arrived at Morgan Studios with best-selling producer Tony Clarke to begin recording their first album. International Times – the counter-culture ‘house magazine’ – interviewed the group at the start of recording, and it was evident that the mood in the Crimson camp was understandably upbeat. Fripp talks about doing a double album with one side per track; Sinfield wants to ensure that everything – music and album cover – is integrated as a total package. The band had gone from complete zeroes to would-be heroes with a cocky master-plan, a double-page spread in the press, a growing reputation for killer concerts, and an album in the works. Not bad going in just six months. Yet the sessions between June 12 and 18 didn’t go quite as smoothly as expected. Something about the sound at Morgan wasn’t working for them. As they relocated to the more spacious Wessex Studios, the band prepared for the gig that would seriously accelerate an already fast-track career – supporting The Rolling Stones at Hyde Park on July 5. King Crimson stepped out onto the Hyde Park stage and faced an estimated audience of 650,000 – a nerve-racking experience for anyone, as bassist/vocalist Greg Lake remembers vividly: “I’d never seen that many people in my life – for any reason. I mean, you’d need a war to see that many people! They weren’t there to see me or King Crimson, they were there to see The Rolling Stones, so in a way it wasn’t that bad. Returning to Wessex Studios on July 7, Crimson and producer Tony Clarke had a second attempt to record the album. Almost immediately more doubts about the sounds they were getting resurfaced. Maybe it wasn’t the studio that was the problem. Maybe it was the producer. Clarke’s preferred way of working – slowly building up big backing tracks as he’d done with the Moody Blues – wasn’t suiting Crimson’s dash for dynamics and cocky, live-take bravura. On July 16 they decided to walk away from Clarke and also the prospect of a Threshold label release that came with him. It seems almost inconceivable that a young band who had only been together just over six months would take such a risk at such a pivotal point in their career. Another example of Crimson’s so-called ‘Good Fairy’ that they talked about looking after them, or testosterone-fuelled balls of steel? On Monday, July 21, 1969, as man first walked on the Moon, King Crimson walked into Wessex Studios, took control of their own fate and began work on their elusive debut album for the third time. Over the next fortnight, in-between gigs, they spent three days laying down backing tracks for In The Court Of The Crimson King, one day apiece on I Talk To The Wind and Epitaph, a day on Moonchild and its improvised instrumental work-out, and, finally, Crimson’s magnum opus, 21st Century Schizoid Man, completed in just one, devastating, live take. The album’s final overdub – Robert Fripp’s one-take guitar solo for …Schizoid Man – was completed on August 20, with plans already under way for the finished album to be leased on Chris Blackwell’s Island Records label. If the band and their fans (including Pete Townshend, who famously dubbed the album “an uncanny masterpiece”) thought things had been moving fast for Crimson prior to its recording, the whole adventure went into hyper-speed when the album was released in the UK in early October. Going straight into the top five of the UK chart, the potent, ground-breaking music, with its iconic album sleeve – one of the first not to have a band name or record company logo on its gatefold front – demanded to be heard. The band had been together less than nine months at this point. Running like the soundtrack to some epic, unreleased movie, the album was a decisive break with the blues-rock motifs that still dominated much of the underground scene’s output. There are no lengthy solos anywhere on the album. Instead their collective firepower is directed into beautifully crafted and detailed arrangements, symphonic allusions and a precocious ambition in a group so young. The unrelenting pace of Crimson’s life on the road began to take its toll once the band arrived in the USA as the album entered the Top 20 there. In the midst of a kaleidoscopic American travelogue that covered the vast coast to coast distances, Michael Giles and Ian McDonald, homesick, lovesick and beginning to find the hectic pace more than they could handle, both decided to quit the band at the end of the tour. When Crimson left the stage of San Francisco’s Fillmore West on Sunday, December 14 it was over. The whirlwind of 1969 had seen them play more than 70 gigs and get one album out in a mere 335 days from start to finish. Though King Crimson would continue with different line-ups over the ensuing years, the one now iconic album by the original, short-lived group has become a touchstone and a defining moment in rock’s development. McDonald: “The second track we recorded. My original demo was a little bit more up-tempo and had some guitar strumming, but we changed the arrangement once we got into the studio. One thing I’m pleased with is that I managed to pull out a pretty nice flute solo at the end, under relative pressure. I actually did two and we put them together. You can hear where it goes from one to the other, but that didn’t bother me. Sinfield: “It’s got some beautiful guitar sounds by Robert – very tricky. Mike’s little pings like water dropping on the cymbals. The vocals are lovely. It was everything it should be. I knew at the time that that track was special, because it was just so moving to listen to. Sinfield: “Epitaph was a poem that I’d written when I had my own band. It started with the words, and then it was very much a piece of ensemble writing. Ian would come up with an idea, then someone else. I think Greg came up with the idea: ‘But I fear tomorrow I’ll be crying’, which is very Greg-ish. McDonald: “For some reason, getting that track right eluded us. Epitaph took about 10 hours to put the basic track down down – I made a point of noting that down in my diary. But I think it was worth it because, to me, that’s one of the best tracks on the album, if not the best. McDonald: “We’d run out of material. And we didn’t want to put a cover tune on our first album. So we were left with gap; we needed another seven to nine minutes. So once we’d recorded the basic track [the front section, with the vocals], Mike, Robert and I went back into the studio, set the tape rolling and just improvised for about 10 minutes. And I think it’s alright. The lush-textured, panoramic, epic title track that closes the album was actually the first track the band recorded, on July 16. Hearing this huge, gothic, densely orchestrated piece, it’s almost impossible to believe that it was originally “a sort of Bob Dylan song, if you can imagine that”, says Sinfield. “Ian took it and rewrote the music. He’d studied harmony, he’d studied orchestration, so his references were not just The Beatles, but also big, sweeping things like Stravinsky, Mahler, things that were emotional. And that would come out. That track did take quite a while to pull together. King Crimson play London's Albert Hall on the 18, 19 and 20th of June 2019. Tickets are on sale now.